Dark Chocolate Brownies layered with mini Rolos and Peanut Butter Krispies. Thanks to Cook’s Illustrated for the delicious recipe for the brownie base! I’m often asked, where do I get my inspiration for recipes? Seriously, I can’t even pin point. They come to me in dreams! I wake up and scribble notes at my bedside. I keep a list on my phone as I’m walking through a grocery store and an idea may pop into my head. I go to retreats and hear Chef’s talk about products and techniques and stick post it notes all over my computer! I read dozens of blogs every day. I subscribe to and read half a dozen food magazines and I have a bookshelf overflowing with cookbooks. I have spent a lot of money on those cookbooks through the years, only to be sorely disappointed. Some of them are filled with food I would never dream of making, or techniques that are vaguely explained. When America’s Test Kitchen reached out to me and asked if I wanted to review the Cook’s Illustrated Baking Book cookbook, I actually jumped at the chance! I have so many friends and family who LOVE their work. And how they explain the what and the why behind using certain ingredients is eye opening! This Baking Book is no different! I am in love with all of the detail put into this book. Seriously, you guys, I kinda feel embarrassed encouraging you to buy this book. You won’t ever have to stop by my blog anymore, all the recipes you’ve dreamed of making are in The Baking Book. However, I had to find a way to remind you all why I exist. In my ever loving quest to find the perfect brownie recipe (hey, you can never have too many perfect brownie recipes) I decided to give The Baking Book a try. I am pretty picky when it comes to brownies. I don’t like those dried out blocks of chocolate brownies you see in the bakery. I like a gooey, fudgy, undercooked dark chocolate brownie. Any one else? To make this recipe even better, I added some Rolo minis on top. And that layer or krispies? It’s a peanut butter, chocolate, crispy rice cereal mixture that is amazing! So yes, get a copy of this book for yourself. I highly recommend it! The cookbook is filled with over 450 recipes! 450! But then, be sure to stop by my blog to see my twist and tricks on those recipes, ha!! Love Brownies? I happen to have a few favorite recipes…. 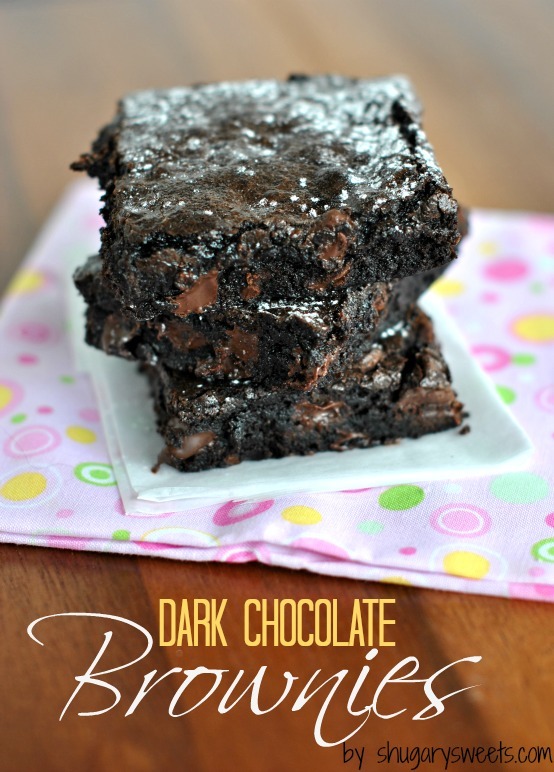 Previously, my favorite Dark Chocolate Brownie recipe! Peanut Butter Brookies: when cookies meet brownies! 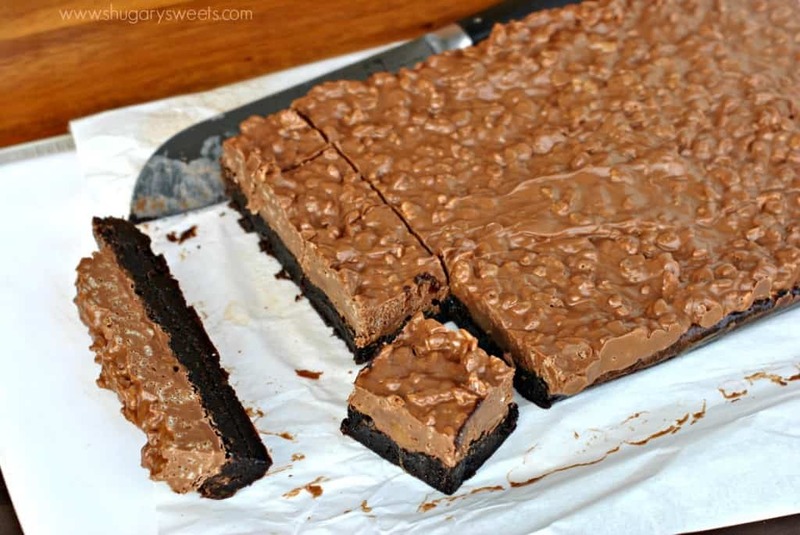 Dark Chocolate Brownies layered with mini Rolos and Peanut Butter Krispies. Thanks to Cook's Illustrated for the delicious recipe for the brownie base! Line a 13x9 baking sheet with parchment paper. Preheat oven to 350 degrees. In a large mixing bowl, combine cocoa powder with boiling water. Whisk until smooth. Add unsweetened chocolate and continue to whisk until melted. Add oil and melted butter, mixture may appear curdled. Add eggs, vanilla and sugar, whisking until fully combined. Using a rubber spatula, fold in flour and salt just until combined. Pour batter into prepared pan, spreading into the corners of the pan. Bake for 30 minutes. Top with rolos in a single layer and return to oven for 3-5 minutes. Using a spatula, smooth melted Rolos over the top. Place on wire rack to begin cooling. In a medium saucepan, combine peanut butter, butter and milk chocolate. Heat over low and stir constantly until mixture is smooth. Fold in cereal. Spread over warm brownies and allow to cool completely. Once brownies have cooled, cover with foil and refrigerate for 2-4 hours (or overnight), allowing the top layer to harden. Cut into squares and enjoy! 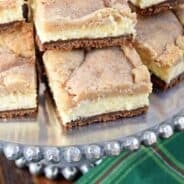 Today’s recipe for Peanut Butter Krispies layered Brownies was originally published on Shugary Sweets on October 14, 2013 and has been republished in September 2018. **I was provided a copy of the book, Cook’s Illustrated Baking Book. No other compensation was received. All opinions expressed are, as always, 100% my own! These look like a chocolate lover’s dream, (and that means me)! 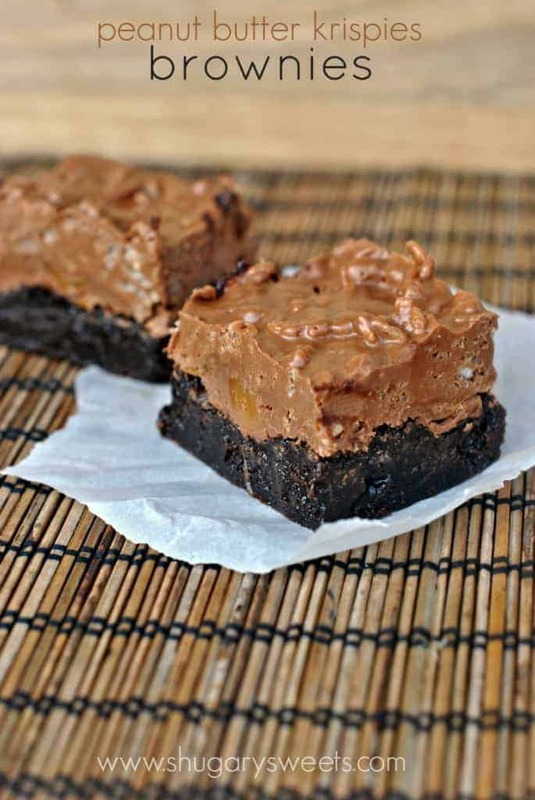 I’m always on the lookout for the next greatest brownie recipe, so I need to try this. I dream about food too, and I can tell you I will see these in my sleep tonight. these look awesome! i love the crunchy texture that’s incorporated into these! They look absolutely wonderful! This cookbook looks like a gem and I love how you took a basic recipe and added your own twist!! I love Cook’s Illustrated!! Your brownies look divine. 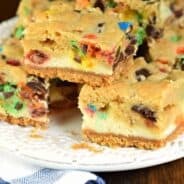 I love America’s Test Kitchen and I love these krispie brownies! So much yumminess in one bar! 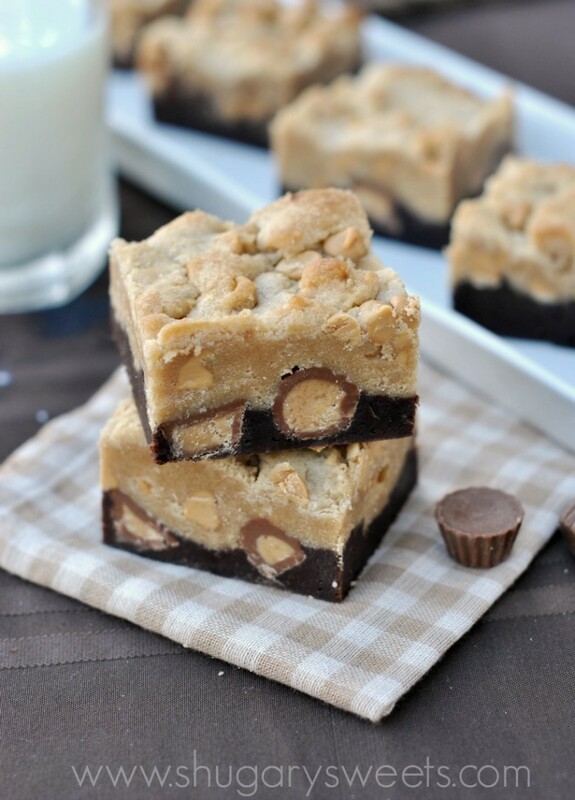 I have a recipe for brownies along these lines in my Peanut Butter cookbook! Thankfully they’re different enough – but it’s a brownie base, with a layer of Reese’s Cups, topped with the a choc-PB-crispy cereal topping. 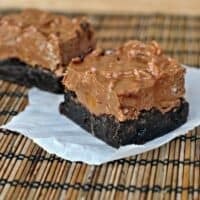 As much as I love fudgy brownies, I truly think the topping is where it’s at. I can tell your topping is excellent! I love this kind of topping so much I re-purposed it in a recipe last week! 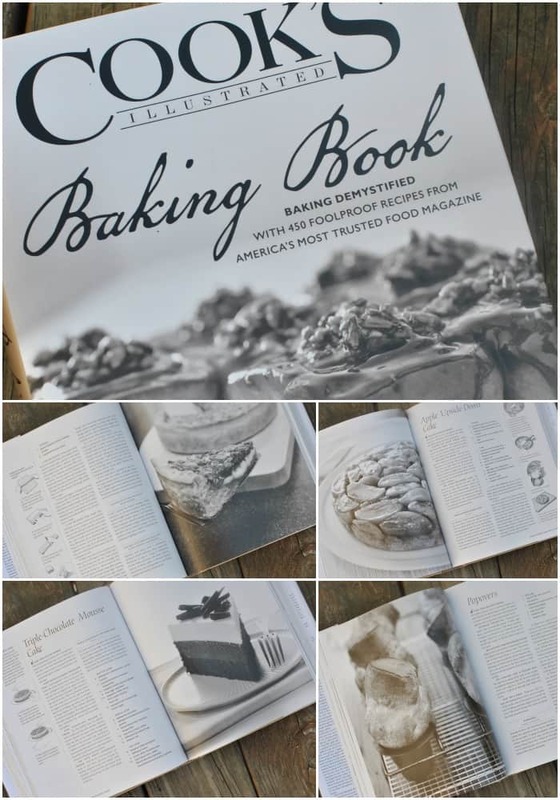 The Cooks Illustrated New Best Recipe (1200 pages) is amazing – I can only imagine how great the BAKING version is! Those tips are great! I’ve never been able to nail down the chewy texture – now I can! And you made me laugh when trying to list your inspiration:) Seriously, I’m constantly thinking about it, like, in my sleep. It doesn’t help I read your blog either; you are FULL of amazing ideas! 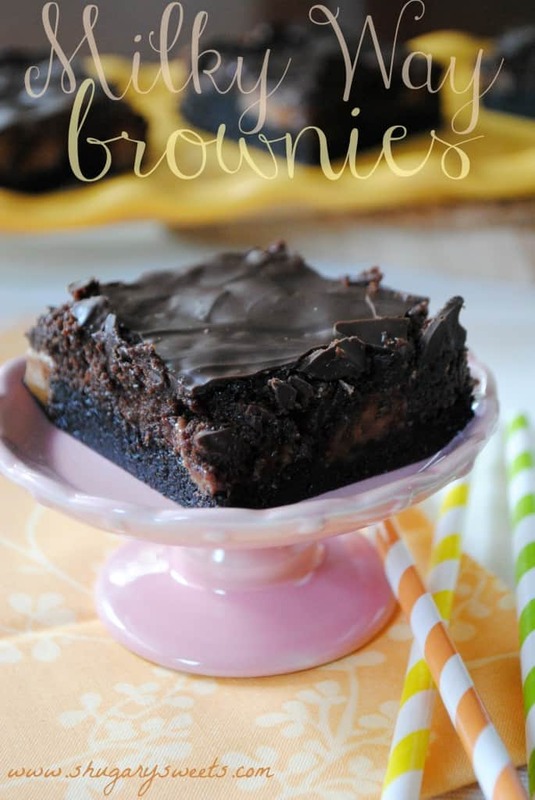 Like this, Rolos and brownies must be a match made in heaven! Well now I know I need to add another cookbook to my Xmas wish list! Ugh, as if I don’t have enough of them lol 😉 These brownies are absolutely amazing, Aimee! Decadent and I adore all the layers of flavor! Oh my gosh, these look so delicious! I think your brownies recipe looks fabulous, even on its own. Pinned! Oh my goodness, is this real life? These look so decadent, so lustfully amazing, drooling is totally happening on this side of the screen. I do wish I could just reach out and grab one. Or five. Of these amazing layered brownies. Wow. YUM! This is doubly delicious with the two layers. 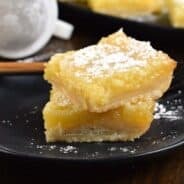 My husband would go nuts over this recipe. Thanks for sharing. I’m saving it to try very soon! These seriously look like the best brownies on the planet!! My hubby is gonna love these! That is so cool that you got the review Cooks mag. That has alway been one of my favorite cooking/baking resources. I’ve been hooked on the America’s Test Kitchen show on Create channel. Everything they make is amazing; well explained and very do-able! I can’t wait to get a hold of this cookbook! And those brownies! Holy cow! They look amazing! That extra topping with the krispies I’m betting put them right over the edge of insanity! LOL Thanks for the recipe! I am totally dying over these. And totally adding that cookbook to my wish list! The genius people at CI always know what they’re doing! Thanks for sharing the wonderful tips and for creating these perfect brownies! I love Cook’s Illustrated, especially the explanation they give at the beginning of each recipe. These brownies look out of this world decadent! Pinning! Insanely delicious! I must give these a try! This recipe was so exceptional, I had to leave a comment. We ate it for days, tiny slice by tiny slice. I thought about it in the car on my way home, knowing it was sitting on the counter waiting for me. Absolutely sensational. I have got to say I these were a massive hit with everyone. Saved and shared the recipe it was so good. I’m so glad to hear it, thanks for letting me know! I’m so with you! I’ve bought cookbooks before with insane ingredients and techniques and that’s such a bummer! I have an earlier version of this cookbook, The Family Baking Book, that I LOVE. Excited to see the updates here! PLEASE, PLEASE,PLEASE remove me from your emailing list. I have been begging for a month to be removed from your list. I do NOT bake or cook. I do NOT want your emails. I do not see an unsubscribe button on your site. I would like the recipe for lemon cheesecake, please.